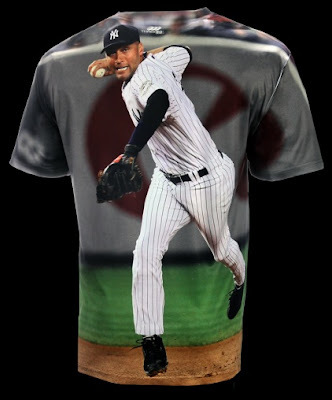 Your one-of-a-kind Three60 Gear™ original photo t-shirt has been created by hand using vivid action baseball photos. The performance fabric includes wicking, anti-microbial properties, and is dye sublimated resulting in white areas near seams, creases or folds. These are marks of the authentic handcrafted process. All of the men (and boy's) in my family EAT.SLEEP. AND BREATH.....SPORT'S! Their affinity stretches wider than a single sport, they LOVE THEM ALL! They all have large collections of fare displaying their pride in their favorite teams, and their collection's of hat's and shirt's is nothing short of impressive. 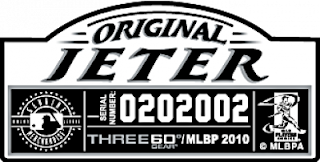 Though,, out of all of their memorabilia, nothing is quite as unique as the photo shirt's fromThree60 Gear™. These shirt's actually allow them to wear their favorite sport's moments! Aptly named, the photo shirt's by Three60 Gear™ depict a memorable moment from two separate games (MLB, NBA, and NHL Team choices available) on the front and back of each shirt. The pictures cover every inch of these seemingly seamless creations. Being a die-hard New York Yankee's fan, my husband naturally went with the Derek Jeter Shirt (Pictured Above: Front & Back). The shirt itself is made of a soft anti-microbial, moisture wicking material, for a seamless look (maximum comfort), and perfectly displays the sports action shot's, from some of the most memorable games! Each photo-real shirt includes a patch (pictured above) with its own serial number that details the date and location of each photo.This truly unique sportswear by Three60 Gear™ allows sports fans to wear their favorite sports memories "on their sleeve" literally. Support their love of sport's! WOW the Sport's Fan in your life this Father's Day with an awesome shirt from Three60 Gear™! WOW the Sport's Fan in your life this Father's Day with an awesome shirt from Three60 Gear™! One Lucky Reader will receive a shirt of their choice (RV$55)! Leave a comment~ Visit http://www.three60gear.com/ and let me know which shirt you would like to gift to a Father' in your life this Father's Day! The comment is considered your entry. Entry to this giveaway ends on July 9, 2011.Winner's are chosen randomly through random.org.The winner will be announced within 7 days of the giveaway ending and contacted through email. The winner will have 48 hrs. to respond or another winner will be chosen. I would get the Lebron James T-Shirt. We LOVE hockey here so I'm sad to see that the NHL section says "coming soon". So, I guess I'd have to pick a Albert Pujols shirt for now! I'd get the Lebron James T-Shirt. GO HEAT! I'd have to go with my hometown boy, the Justin Morneau Shirt! Awesome! I'm entered in the Magic Cabin giveaway! I'd LIKE to get the Boston Red Sox t-shirt for my hubby.